“BRIDGE” together with international organization “Save the Children” implements DIPECHO funded project – “Supporting Disaster Risk Reduction in South Caucasus”. The project is being implemented in Kakheti, Mtskheta Mtianeti and Adjara; its aim is to strengthen resilience of vulnerable groups and local self-governments, by means of strengthening – duplication of preparatory measures and response models for disaster impact reduction. The project goal is raising awareness of vulnerable groups and local government on disaster risk reduction and implementation of the models for the management of disasters, with the participation of women and man, vulnerable groups, people with disabilities, youth and elderly population. One of the directions of the project is the support of National Resilience Forum, which ensures development of the platform, which unifies all stakeholders from different fields, engaged in the activities related to disaster risk reduction, climate change, adaptation and environment. Within the frame of the Project, disaster risk reduction resource centers are established in target regions. 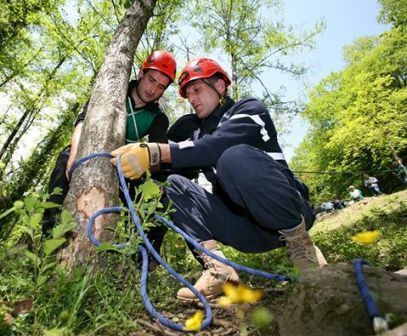 Local rescuers are selected and retrained. Small mitigation projects are implemented, which were selected in accordance with the interests and priorities of local population.